It took Jake Svihel four tries, but in his final high school wrestling match he went out as an individual state champ. Svihel, a 126-pound Totino-Grace senior, was a three-time state runner up before Saturday afternoon. Now he is a champion, after defeating childhood friend Mitchel Petersen in a rematch from last season’s 120-pound title match. Mankato West’s 132-pound Charlie Pickell ruined Simley sophomore Ryan Sokol’s dream of winning five state championships when he beat him in the semifinals of Sokol’s eighth-grade year. On Saturday morning, Pickell, a two-time state champ, eyed Sokol down as Sokol came off the mat after taking a semifinal victory by tech fall, setting the stage for a heated revenge match. Sokol ended the season undefeated (51-0) by beating Pickell after he escaped from Pickell in the final seconds of the third period and pinned him with four seconds remaining. Sokol said he won the match for his friend Curtis LeMair, a Prior Lake native and wrestler who died last fall. Maple Grove’s Joey Thompson and Byron’s Maxwell Petersen each took 106-pound titles last season. Thompson, a junior, transferred to Totino-Grace this year, and each wrestler moved up a weight class to meet in the state championship match. Only one could take first, and Thompson came out with a 10-5 victory and his first state championship with his new school. “[Maple Grove wrestling] was still family, and yeah it was hard. But I found a lot of guys who love me and would die for me, and that’s what I love about TG,” Thompson said. The No. 1 heavyweight high school wrestler in the nation, Simley’s Greg Kerkvliet, took his fourth individual state title on Saturday with a pin in 59 seconds. It was the longest match of his individual state tournament. Kerkvliet, who weighed about 50 pounds less than his competition over the weekend at 230 pounds, said he plans to redshirt next year at Ohio State to gain weight and get ready for the college heavyweights. Danny Striggow, a junior 220-pound wrestler from Orono, got pointers from his older brothers, who both wrestle at Michigan, after every state match to guide him to the state championship match. Striggow defeated Kasson-Mantorville’s Garsen Schorr in a 16-5 major decision to join Bobby and Jackson by capturing his first state title. Striggow said he deciding between participating in football or wrestling when he goes to college in two years. A year was a long time for Kenyon-Wanamingo senior Jeron Matson to wait for a little redemption. That explains why Matson couldn’t stop smiling after beating Trevor Janssen of Blackduck/Cass Lake-Bena 3-0 in the 120-pound final. Matson had won back-to-back state championships as a ninth- and 10th-grader. But an undisclosed team rules violation at the state meet last year forced him out of the meet, costing him a chance at third straight title. Getting back on top this season and restoring his reputation was the focus this year. It almost didn’t happen after he tore the meniscus in his right knee in early January. He didn’t return to the mat until the Section 1 meet a month later. Matson said this year’s victory was likely his most satisfying. 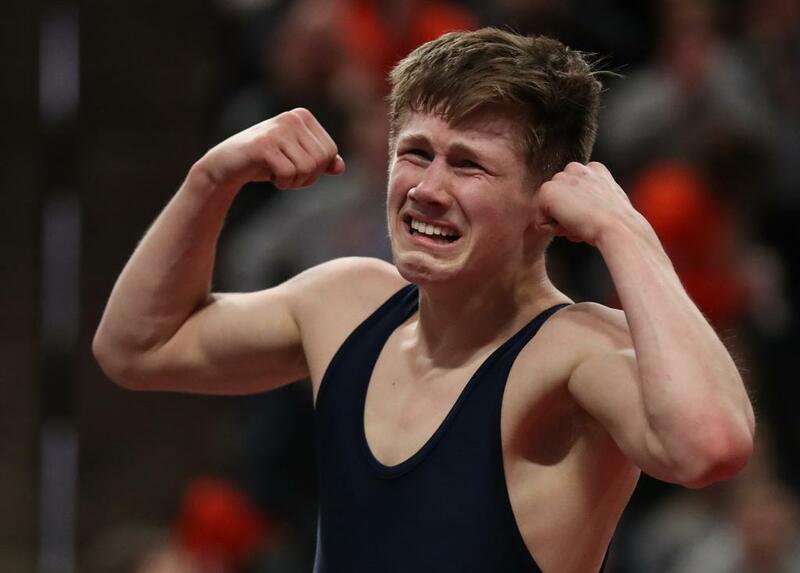 • Two-time state champs: Joey Thompson, Totino-Grace 113 (106 3A); Jaxson Rohman, Fairmont/Martin County West, 120 (113); Bennett Berge, Kasson-Mantorville, 160 (138); Isaiah Thompson, Detroit Lakes, 170. • Undefeated Class 2A wrestlers: Mason Gehloff, Waseca, 106 (31-0); Jake Svihel, Totino-Grace, 126 (57-0); Ryan Sokol, Simley, 132 (51-0); Patrick Kennedy, Kasson-Mantorville, 182 (46-0); Ty Moser, Perham, 195 (46-0); Daniel Kerkvliet, Simley, 285 (24-0). • Kasson-Mantorville’s Patrick Kennedy won his third individual state title.